In September of 2015, Terror Films announced that it had acquired Unearthed & Untold: The Path to Pet Sematary, the documentary chronicling the origins of Stephen King's bestselling horror novel, Pet Sematary and its journey from script to screen. For eager fans that have long awaited the release of the documentary, which took filmmakers John Campopiano and Justin White nearly 5 years to complete, the wait is finally over. We have the first trailer and poster, which pays homage to the old Warner Bros. VHS cover art from back in the early 80s. In celebration of the 27th Anniversary of the original film's theatrical release, Terror Films premieres the documentary's official trailer, poster and a special one time limited edition promotion. The details of what's included in the promotion are featured in the flyer seen below with complete details provided on the Terror Films Store Link. The documentary promotional release will begin on April 27th and continue for 27 Days, ending on May 18th and will be the only time this Limited Edition Offer will be available, prior to the documentary's official release currently set for October 2016. During this limited time frame, fans will be able to order the Limited Edition Combo Pack, which will include a dual Region Free DVD / Blu-Ray copy of the Documentary featuring interviews with Director Mary Lambert and the entire cast; including Dale Midkiff, Denise Crosby, Miko Hughes, Brad Greenquist, Susan Blommaert, the Berdahl Twins and many more. The film also features never-before-seen footage from the sets in Maine, interviews with key crew, the town's people and packed full of bonus features, including a fan appreciation sizzle reel, a personal interview with the documentary filmmakers and much, much more. The film, which was discovered by Terror Film's exec Jim Klock at the Rhode Island Flickers' Sci-Fi, Fantasy & Horror Film Festival in 2014 is an important release for the company and they are not taking it lightly. Terror Films exec, Joe Dain who negotiated the deal with the filmmakers stated the following. "We not only understand the relevance of our Company's association with this iconic film via this incredible documentary; more importantly we understand the obligation we have to the fans to make this release as special as possible." Filmmakers Campopiano and White stated this. "When we first set out for Maine nearly six years ago we thought, at most, we would take some photographs of the filming locations from Stephen King's Pet Sematary and post them to social media. But upon that very first visit we knew that we had stumbled upon something special -- stories, people, and places that had been barely documented for the extensive, global horror fan community. We knew within that first year that we needed to go back to Maine and continue to dig, not just to satisfy our own curiosities but also to try and bring an in-depth making of story about Pet Sematary to others who also share a deep appreciation for the film. 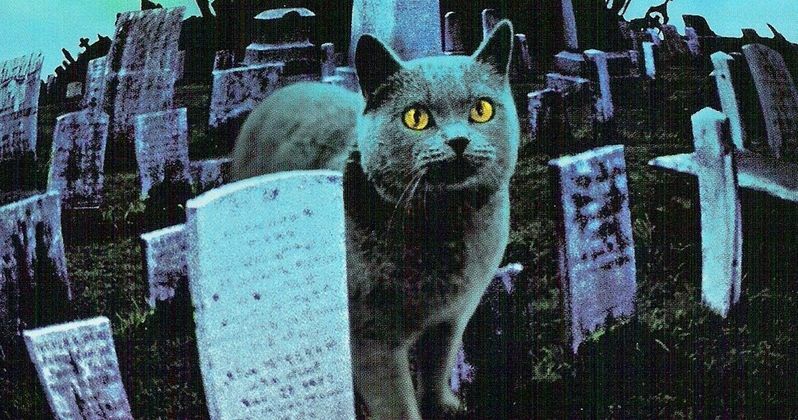 Terror Films has stepped up and showcased a similar love for Pet Sematary but, more importantly, the belief that the stories, people, and places we've documented have significance and ought to be shared with anyone who has an interest in Pet Sematary, Stephen King, the horror genre, or film in general." To learn more about this Special Limited Edition Promotion and to purchase the Documentary Combo Pack during the 27 day time frame, please visit the official Terror Films' Shopify Store. You can experience what the movie has to offer in the just released trailer. And then check out the cool new poster, along with that special offer. This is a must for all Stephen King fans.